If you read this blog often then you'll know I love a good comedy, and I love tv. So when the two mix together, it's my one of my favourite things in the world. 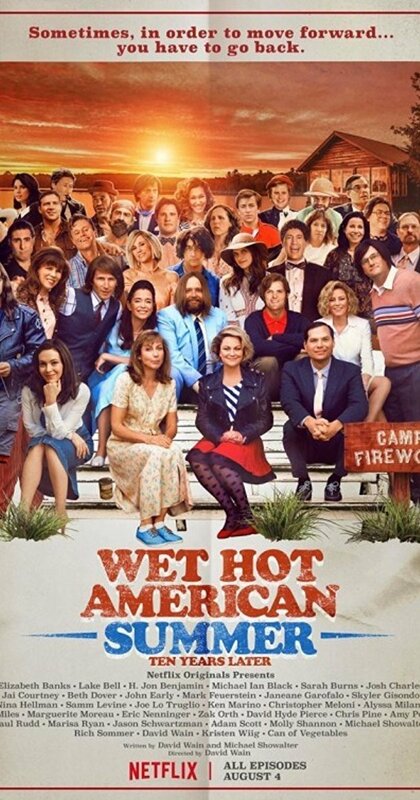 Wet Hot American Summer gives that feeling, the movie and tv show are absolutely fantastic at being a little silly but really original comedy. Ten years later is the second 'limited' series on Netflix to come from Wet Hot American Summer. It stars literally everyone and follows on from the previous themes and plots in the film and the previous tv show. I would definitely recommend watching these first otherwise you'll have literally no idea what is going on, something at which I think is the shows downfall as it is funnier because you know the back stories. Otherwise they'll be a talking can of vegetables on screen and you'll think you are on a weird trip. I am glad ten years later is the last of the Wet hot series. It's a really good combined comedy and I think it was starting to push it at the end of this series, if they did any longer the jokes would just run dry. It's not that is wasn't good, however you don't want to lose any of the originality it has. I would highly recommend this if you are a fan of the cast, and just be prepared for some wacky and wonderful comedy. Have you seen Wet Hot American Summer ten years later? What did you think?